It commonly is painful the first few steps in the morning or after rest. It tends to get worse the longer one stands during the day. It is caused by subtle changes in foot structure that occurs over time. These changes result in the gradual flattening of the arch. As this occurs a thick ligament (the plantar fascia) that is attached to the bottom of the heel and fans out into the ball of the foot is stretched excessively. This ligament acts as a shock absorber while walking. As the foot flattens it stretches. If it stretches too much it gets inflamed and causes pain. Over time the pull of the ligament creates a spur on the heel bone. It is important to realize that it is not the spur that causes the pain and therefore the spur does not need to be removed in most cases. This condition may also cause generalized arch pain called plantar fasciitis. 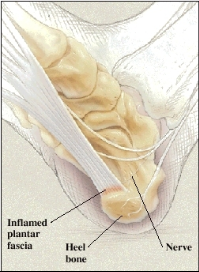 This is an inflammation of the plantar fascial ligament. To prevent future heel pain, wear shoes with well-cushioned heels. And do exercises prescribed by your doctor to stretch the plantar fascia and the muscles in the lower leg. Calf muscle stretching is very useful. The typical runners stretch by leaning into a wall is helpful. An alternative method of stretching is to stand approximately two feet from a wall. Facing the wall turn your feet inward so you are pigeon toed. Lean forward into the wall keeping your heels on the floor and the knees extended. Also keep your back straight and do not bend at the hips. Hold the stretch for 10 seconds and do the stretch ten times in a row. Do the stretching three times each day. Always stretch the calf muscles followingany form of exercise.